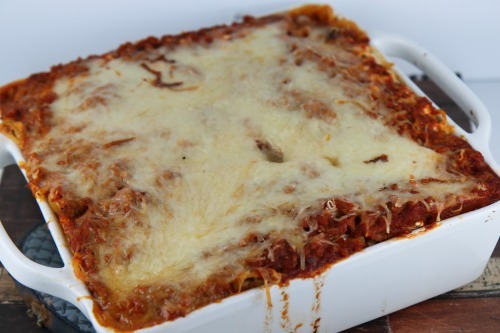 This comforting baked spaghetti recipe is a delicious dinner that can be prepared ahead of time for an easy weeknight dinner or for a potluck dinner. Your family will request this favorite over and over again. 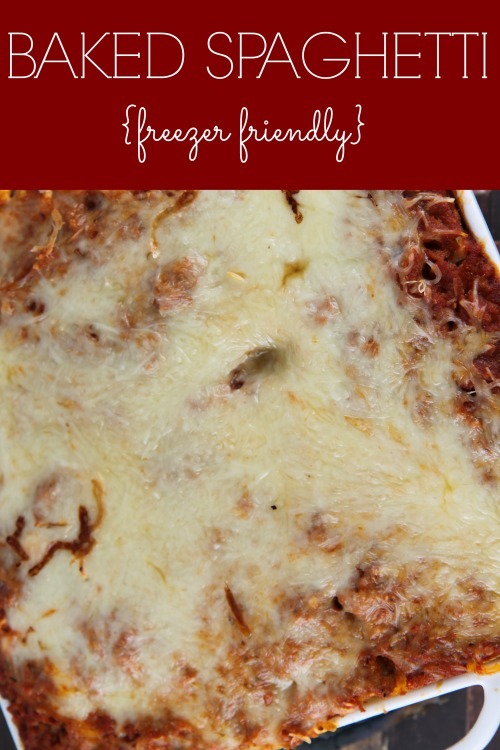 If you are looking to stock your freezer with meals, you can easily prepare this and freezer for a later date. I like to use aluminum pans and store in the freezer until the night before we want to make it. An easy way to start stocking your freezer is to make double of your favorite meals and freeze one. I like to use fresh Parmesan cheese, though you can use grated Parmesan cheese if you want. I can buy a block at ALDI for around $4 and quickly crumble it with my Ninja Kitchen Prep. Sprinkle a little on top before baking to add even more flavor! Cook spaghetti per directions. Rinse and set aside. Cook ground sausage with garlic over medium heat until not longer pink. Add spaghetti sauce and remove from heat. In a separate bowl, combine eggs, Parmesan, and cottage cheese. Add spaghetti to egg mixture. Place half of sauce mixture in a greased baking dish. Top with spaghetti mixture and half of the mozzarella cheese. Bake covered at 350 degrees for 40 minutes or until heated thoroughly. This looks delicious. I’ve always wanted to try making Baked Spaghetti. Thanks for sharing the recipe. Thanks for this recipe. I make something similar from leftover spaghetti, boil noodles once for two meals. My recipe throws in leftover bits and pieces of vegetables as well I did not think about freezing though, thanks for the tip.